This is NOT a sponsored post. It's just a game I'm into, and I wanted to share. Well, I got a new phone a couple of weeks ago, and I've been spending a bit of time browsing the Google Play store looking for apps or games to amuse me in my spare time. 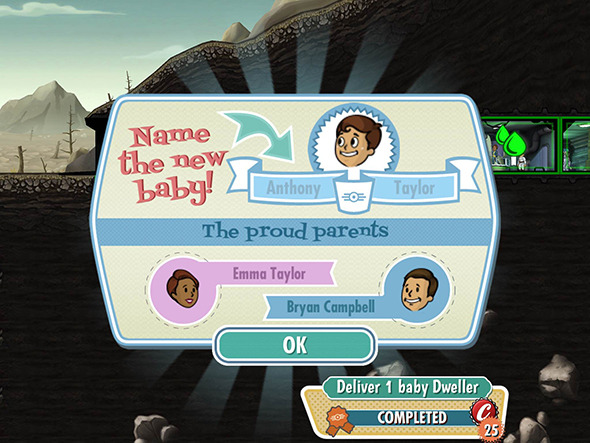 I don't normally find a game I really get into, but then I spotted this little gem: Fallout Shelter. As an avid PC gamer, I came across the Fallout franchise when it went on sale a few months ago on Steam. I bought Fallout 3, and have been hooked ever since! 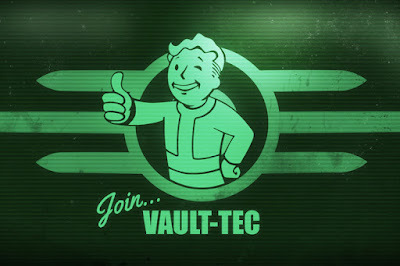 In Fallout 3, you play as a Vault dweller, who is forced to leave the safety of the Vault, and explore the nuclear fallout landscape (called the wasteland), in search of your father. The entire franchise has a very 50's feel to it, and the distinct art style reflects that. Thankfully, the Fallout Shelter app keeps with the feel of the original games! Unlike in the other Fallout games though, you don't explore the wasteland or see the horrors it holds. 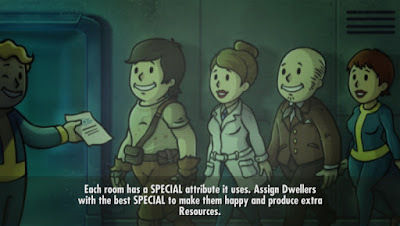 Instead, you play the role of a Vault Overseer, who is in charge of keeping the dwellers in your vault happy, healthy, and safe from everything the nuclear apocalypse has in store for them. You build rooms that give you basic resources, such as water, power, food, medical supplies, and more. You place dwellers in the room that best suits their SPECIAL skills, to help you gain more resources. I was thrilled to see SPECIAL being used in this app, since it's such a vital set of statistics in the main games. SPECIAL stands for Strength, Perception, Endurance, Charisma, Intelligence, Agility and Luck. 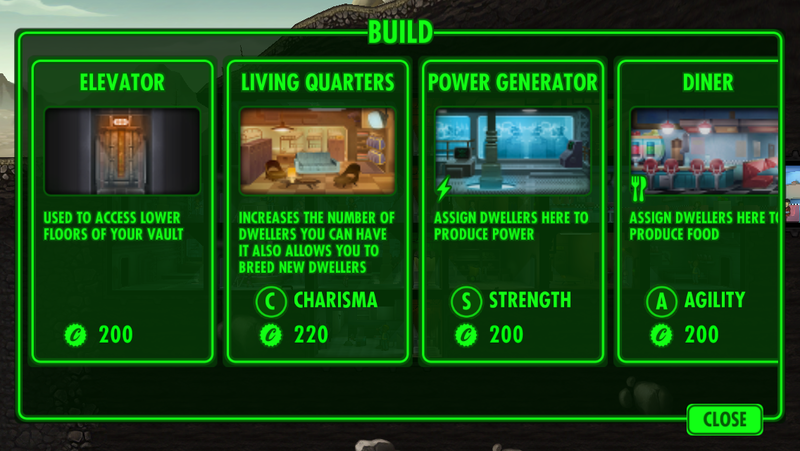 Each of these stats plays a huge role in the app, and will dictate what dwellers you can put in what rooms, how fast resources are gathered, etc. But Fallout Shelter isn't just a boring level-builder game. Oh no! You're also tasked with repopulating the now desolate world! 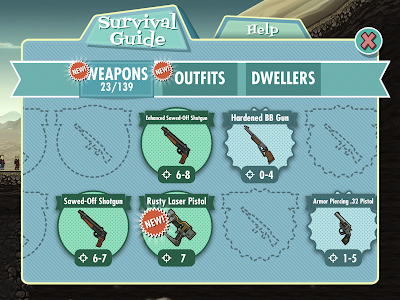 Or...at least starting by filling up your vault. 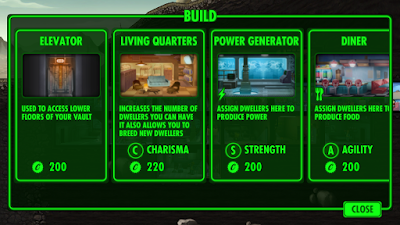 You can create more dwellers by placing a male and a female in the Living Quarters, and well...just waiting for human nature to kick in. What else can you really do to entertain yourself in a subterranean community where work and survival comes first? 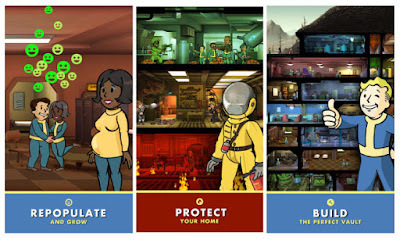 You can also send dwellers out to explore the wasteland, where they will bring you back caps (bottlecaps are the in-game currency), new armors and outfits to equip your dwellers with, and weapons to help fight off the raider attacks to your little hive of safety! Overall, I'm incredibly impressed with how well this Fallout app came out. It ties in well with the main franchise, but is good enough to stand on its own as a credible game. If you're a fan of the franchise, I can't suggest this download enough! If you've never played the main games, I still suggest giving this little app a try. It's fun, it's unique, and it's a good way to waste some time.